Date: Saturday, 8th of April, 2017. The Campaign for Judicial Accountability & Judicial Reforms (CJAR) is a response of people’s movements, campaign organizations and individuals working on public interest issues, to ensure a judicial system that is far more accountable, accessible and sensitive to the poor, marginalized and common people of this country. 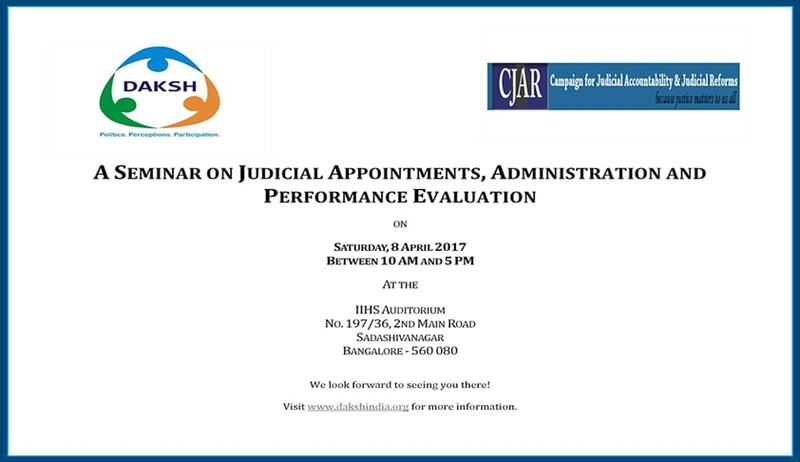 Speakers include Mr. Prashant Bhushan, Justice Santosh Hegde, Mr. Aditya Sondhi, Alok Prasanna Kumar, Arvind Jadhav, Ashwin Mahesh, B.A. Muchandi, Babu Matthew, Dhyan Chinappa, Poornima Hatti, S. S. Naganand and V. Vijaykumar. For detailed schedule, click here.